Road Research Laboratory was established on the 2nd of March in 1999. 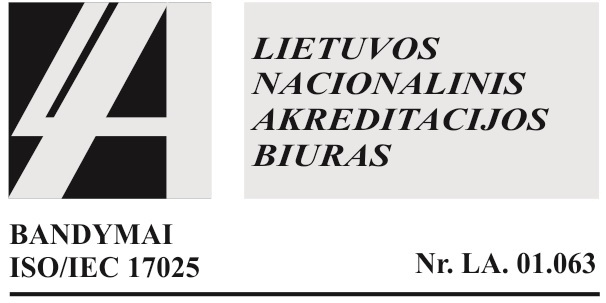 In 2004 the Lithuanian National Accreditation Bureau accredited the Road Resaerch Laboratory and recognized that it fully meets the requirements of LST EN ISO 17025 and our testing results are acknowledged all over the Europe. measurements of road and street pavement strength, smoothness, roughness. The infrastructure for research of roads is the best in Lithuania and highly competitive in the international scale. The laboratory equipment is being updated on a regular basis. Some of the main laboratory equipment units are listed below. Dynamic shear rheometer is designed to determine the bitumen shear modulus and phase angle. Bitumen short-term/long-term ageing equipment is designed to simulate short-term/long-term bitumen ageing processes. Giratory unit is designed for preparation of asphalt samples for rigidity fatigue resistance testing. The device for determining the thickness of layers by a non-destructive method is designed to determine the thickness of layers of asphalt pavement without damaging the latter. This equipment is used for scientific research within the VGTU, and also by the doctoral and master’s students of other European universities. The available infrastructure is also being used for preforming national and international scientific projects as well as business outsourced Research and Experimental Development works. The infrastructure in use is monitored by performing metrological checks. The activities of the laboratory which owns the mentioned infrastructure are accredited and monitored by the corresponding monitoring and control institution.